Český ráj (Bohemian Paradise) is a 182-square-kilometer protected area in the northeast Czech Republic. Located 50km outside of Prague, Český ráj is known for its towering sandstone rock formations, affectionately called “rock towns.” It’s a beautiful area, full of woods, pastoral landscapes, quaint villages, and historical ruins. I spent an invigorating weekend biking and hiking though Český ráj earlier this month. Here’s how it went down. We took the train from Prague to Jičín (changing in Nymburk). We brought our bikes, which you can carry on the train for a small fee (about $2.50 per bike). 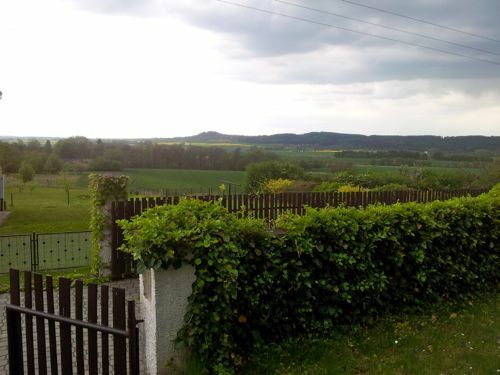 It’s a scenic two-hour trip through the bucolic Czech countryside. Jičín is on the border of Český ráj and has a charming historic center. 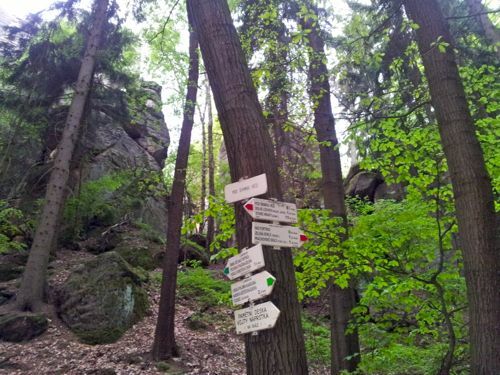 You can pick up maps of Český ráj (with hiking and biking trails) in the Jičín visitors’ center. After taking a stroll through Jičín (stopping for ice cream and dried fruit at a small farmers’ market), we hopped on our bikes and rode to our pension in Horní Lochov, about 5km away. The pension, run by Jana Hakenová, has three spacious mini apartments with all sorts of comforts and amenities–ours had a gigantic bathroom with a sauna! Jana was incredibly friendly, always ready with homemade cake and sightseeing tips. Also, the view from the home was gorgeous. Horní Lochov is located on the edge of Prachovské skály, one of the rock towns in Český ráj. After dropping off our bags at the pension, we set off to explore the park. We weaved through immense rock towers and dense forest. One rock even had a staircase carved into it–at the top, there was a beautiful view of the surrounding landscape. The rock towers were really magical; they reminded me a bit of the trolls that were turned to stone in The Hobbit. The next day, we biked to Trosky Castle. 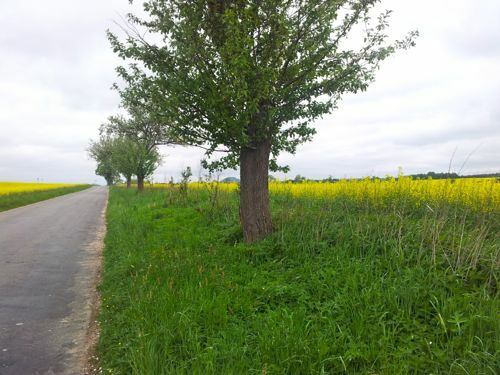 The hilly 13km (one way) ride from Horní Lochov took us through picturesque villages, cool forests, and expansive yellow fields of rapeseed. We passed streams and ponds, more otherwordly rock towers, and happy farm animals. It was a beautiful ride. When we finally made it to Trosky, we rewarded ourselves with a filling lunch and ice cream in the restaurant below the castle. Trosky Castle is one of the most famous castles in the Czech Republic, built in the 14th century. It’s immediately recognizable for its dramatic two-peaked silhouette. Trosky was built on top of two giant volcanic plugs–a shorter, squat one called Baba (old woman) and a taller, more slender one called Panna (virgin). 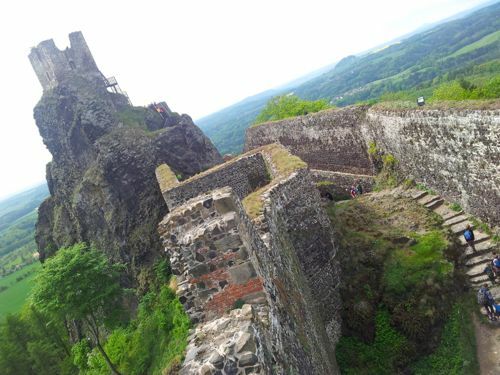 The 360-degree view of Český ráj from Trosky Castle is stunning. The landscape as viewed from "Panna"
After taking in the incredible views, we biked back to our pension to pack our bags. After saying goodbye to our lovely hosts, we rode to the train station in Jičín. Needless to say, I slept like a baby on the train back to Prague after such a full weekend of hiking and biking in the great Czech outdoors. This entry was posted in Explore, Prague and tagged biking, bohemian paradise, camilla, cesky raj, cycling, czech republic, explore, hiking, hrad trosky, jicin, prachovske skaly, prague, trosky castle. What a magical place. Reading your posts and seeing Czech words got me thinking what the keyboard is like to accomodate all the accent marks. Do you speak and write Czech as well?